This weekend my wife and I were in Indio, CA. On the main road through town (Hwy. 111) there is a castle. It did not look open. It looks like it used to be a restaurant or banquet facility. 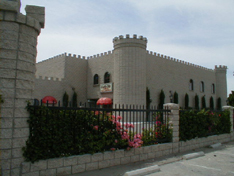 The Castle in Indio, California was, if my memory is right, built originally as a touristy prime rib restaurant in the 1960's or 70's for nearby Palm Springs trade. The above address is correct, but the history of the building is not. I did the real estate appraisal of this structure before it was built [for the construction financing]; so at the time, I had intimate knowledge of the plan for the building. It was actually constructed in the early- to mid- 1990s [don’t have my files to tell you exact date], and was originally planned to be a “family entertainment center,” including a fine dining Italian restaurant [second floor], and a lower-end restaurant to serve the video arcade, indoor bumper-cars, and other kids-play amenities [first floor]. Originally conceived and developed by an existing Indio restaurateur [name might be Mario del Guidice] as a place for his grandchildren (and of course others) to hang out. Not sure if it’s still a family entertainment center, but I know there is still a restaurant there (if not more). This castle found by Joel E. Thomas.